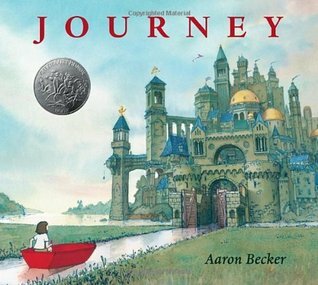 Journey by Aaron Becker is a nominee for the 2015-16 South Carolina Picture Book Award. Journey, a wordless picture book, is an enchanting tale that highlights the power of imagination. It tells the story of a young girl who, using only a red crayon, journeys beyond the walls of her home (where no one pays attention to her) and into a magical place. She travels by boat, hot air balloon, and flying carpet, and she uses her wits (and some help from a special bird) to escape a fearsome ruler and find her way to a new friend. Journey is an excellent book for units of study on wordless picture books. A fun writing exercise may be to have students make up their own narratives to go along with the pictures. This book may also be useful when studying various forms of transportation. How would students like to get from place to place if they had the choice? Like the girl in this book, students’ answers would only be limited by their own imaginations!